Get a Focus Dailies rebate using a rebate form when you order your contact lenses online. I'm always on the look-out for more ways to save money on contact lenses, especially soft daily disposable contact lenses which are the most expensive type of lens as you pop in a new pair everyday. Buying from low-cost online optical retailers is obviously one way, but did you know that manufacturers like Ciba Vision, who make Dailies®, also offer money saving rebates, when you buy a certain number of packs? They tend to do this on either new types of lenses or on new pack sizes so read on if you want to get a rebate on your Focus Dailies disposable contacts. 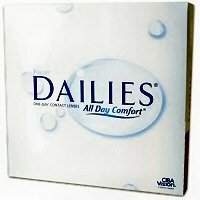 I've already mentioned this excellent value for money Dailies® 90 pack size on some of my other Fcous Dailies pages. At just $35.95 for 90 lenses, there's a saving of 33% versus the standard 30 pack at Discount Contact Lenses.com. But you can save even more on this new pack size by applying for a Focus Dailies rebate when you place your order from Discount Contact Lenses. All you need to do is write "Send Rebate Form" in the special instructions area when placing your order. There is a limit of one rebate coupon per customer and you have to purchase a minimum of 8 boxes, which is a year's supply (720 lenses in total). But with a $30 rebate, this Focus Dailies 90 pack of contact lenses works out at just $32.20 per box. Tip: If you have a different prescription in each eye, just order 4 boxes for each prescription, making 8 in total. PLUS don't forget you can also save money by using one of these coupons from Discount Contact Lenses. $30.00 rebate on a year's supply (24 x 30 pack boxes) of Progressives Dailies®, the only multifocal daily disposable lens currently on the market. After the rebate, each box costs $23.70 instead of $24.95. $30.00 rebate on a year's supply (24 x 30 pack boxes) of Focus Dailies® Toric, the daily disposable lens for patients with astigmatism. After the rebate, each box costs $21.70 instead of $22.95. Tip: Sadly the Focus Dailies rebate applies to US residents only, but you can still save money on all the above lenses by either buying multiple packs to attract a lower price or by using one of the coupons from Discount Contact Lenses.